Eugene, Ore. – Selected results from the Track Town Summer Series meeting at Hayward Field in Eugene, Oregon on Friday, July 29. On the women’s side, Melissa Bishop posted her seventh sub-two minutes 800m time this season after the Canadian record holder clocked 1:59.74 for first place in the women’s two-lap event. Bishop, who is the third-fastest in the world this season and a very strong medal hopeful at Rio 2016 in Brazil next month, defeated a pair of Americans, Brenda Martinez and Shannon Rowbury in the event. Martinez, who missed qualifying for the US team in the event after a fall at the trials, finished second on Friday in 1:59.82, with Rowbury, doing some speed work for her 1500m in Rio, taking third in a personal best time of 1:59.97. Meanwhile, US 800m champion Kate Grace stepped up to the longer 1500m event to take first in 4:09.92, beating teammates Katie Mackey (4:09.97), Lauren Johnson (4:10.12) and Amanda Eccleston (4:10.29). 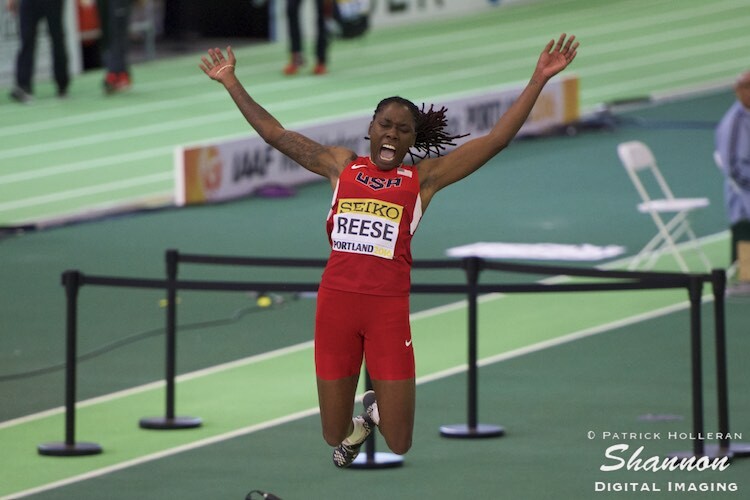 Olympic champion Brittney Reese won the women’s long jump with a last round effort of 6.92m. The American three-time world champion also had 6.91m, 6.84m (+2.7) and 6.69m in the series. Funmi Jimoh finished second with 6.56m and fellow American Jasmine Todd took third with a mark of 6.47m. Elsewhere, in the women’s 100m, Michelle-Lee Ahye of Trinidad and Tobago ran a wind-aided 10.98 seconds (+2.8) to take the event. On the men’s side, Chris Carter of USA leaped a personal best of 17.18m, but had to settle for third place in the men’s Triple Jump, as his countrymen Will Claye and Omar Craddock jumping wind-aided marks to finish ahead of him. Claye, with the help of a +2.2 m/s wind, did 17.52 to win over Craddock, who did 17.42 with the help of a +3.1 m/s wind. Claye also had a wind-aided mark of 17.33m, but the Olympic silver from London 2012, also had legal marks of 17.40m and 17.10m. American Quentin Butler won the men’s 100m in 10.06 secs, Erik Sowinski ran 1:45.38 to edge of countrymen Duane Solomon (1:45.66) and Harun Abda (1:45.77). Jamaica’s Andrew Riley won the men’s 110m hurdles with a time of 13.35 secs and USA’s Erik Kynard won the men’s high jump with a clearance of 2.29m.